You may ask yourself… how did a Yiddish story by Sholem Aleichem, based on a surrealistic painting by Marc Chagal, become one of the world’s most popular shows ? You may ask yourself…. how could a 1964 Broadway musical touch audiences after 50 years? But, of course…. 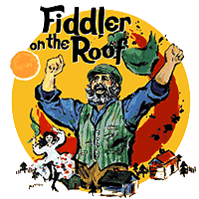 if you know “Fiddler on the Roof” you wouldn’t have to ask! “The Fiddler,” as depicted by Marc Chagal, symbolizes the struggle for survival and balance in a precarious world. A precarious world? That is something Jews know a little something about. From Tevye’s confident reliance on “Tradition” to the sweet naiveté of “Matchmaker, Matchmaker;” from Tevye’s ultimate acceptance of his life in “If I Were a Rich Man” to the bitter-sweet realization that life is an ever-changing landscape in “Sunrise, Sunset;” the collaboration of Jerry Bock (music) and Sheldon Harnick (lyrics) touches our hearts with one of life’s greatest lessons. We yearn for stability and tradition while, at the same time, we are compelled to adapt to change. The Judaica Sound Archives at FAU Libraries is proud of its role in preserving the traditions of Jewish culture despite our ever-changing world. Please consider making a financial contribution to help us fulfill our mission. Click here to see albums and hear snippets.